This website is the companion of the book "Applied Survey Methods - A Statistical perspective" by Jelke Bethlehem. This is a book about the theoretical and practical aspects of surveys. The website is a quick reference guide to some of the most important aspects of surveys. It explains what surveys are and provides a short overview of the theory of simple random sampling. Using simulations it is shown that survey based estimates are reliable if probability sampling is used. Non-response is presented one of the most serious problems for sample survey. Non-response may lead to estimates that are seriously biased. This is shown by means of a simulation experiment. Non-response problems may be reduced by carrying out some form of adjustment weighting.A simple example of weighting is given. The website contains a number of tools. They may assist you in doing some of the computations, There are tools for generating random numbers, selecting a random sample, computing the sample size and computing estimtes and conficence intervals. There are two software packages that can be downloaden. One is the program SimSam for simulating random samples from finite populations. The other is a demo-versions of the Blaise Sustem for computer assisted interviewing. 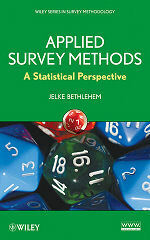 The book Applied Survey Methods - A Statistical Perspective by Jelke Bethlehem is a book about surveys. It describes the whole survey process, from design to publication. It not only presents an overview of the theory from a statistical perspective, but it also pays attention to practical problems. Therefore, it can be seen as a handbook for those involved in practical survey research. This includes survey researchers working in official statistics (e.g. in national statistical institutes), academics and commercial market research. The book is the result of many years of research in the area of official statistics. Since the 1980’s there have been important developments in computer technology, which have had a substantial impact on the way in which surveys are carried out. These developments have reduced surveys costs and improved the quality of survey data. However, there also new challenges, like increasing non-response rates and self-selection web surveys.